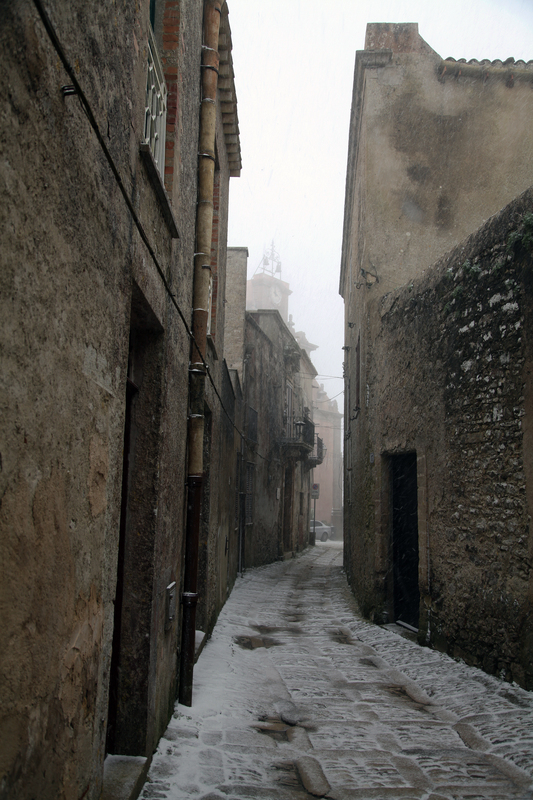 The hail came first and then it turned to snow – the first time for decades that Erice, this walled medieval town in the west of Sicily, had been doused in white. I clung to door knockers, church gargoyles and crumbling stone walls. It was as though some trickster had polished the ancient cobbles with the sole intention of sending me flying. The narrow streets were deserted. I had been the sole passenger in the bus that had snaked its way up the mountainside, 750 metres above sea level. No doubt the view had been awe-inspiring but I had dared not look. 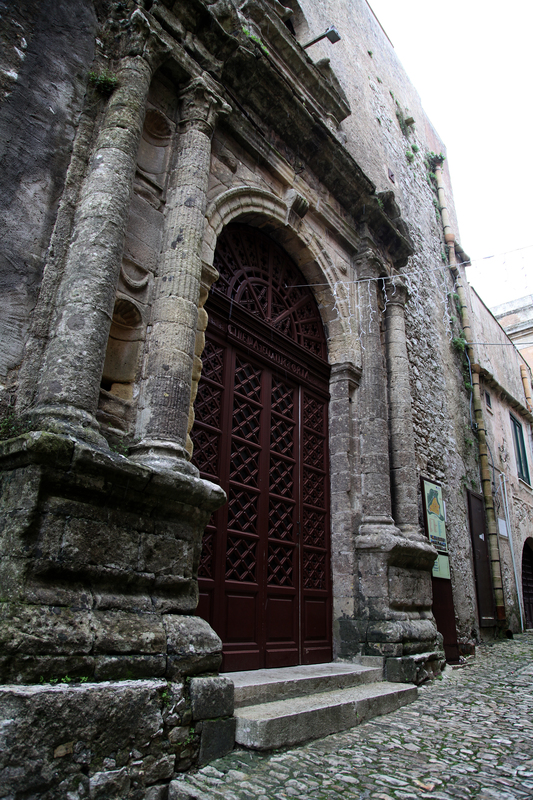 Erice was first settled by the Elymians. Although indigenous to Sicily these local people adopted many aspects of the culture of the first colonists, the Greeks. They even built the nearby magnificent temple of Segesta, built in 420 BC, that still survives today. You would think that Erice would be impregnable but Carthaginians, Romans, Arabs and Normans have all forced entry over the centuries. Frederick 111 of Sicily, on the Spanish side, retreated here during the twenty-one year War of the Vespers between the French and the Spanish at the end of the 13th century. The war had been started when a Frenchman harassed a Sicilian woman on Easter Monday at evening prayers – 4,000 French men were killed in Palermo, the capital, over six weeks. It was the one time, throughout their history, that Sicilians stood up to their colonisers. But to overcome their French oppressors the Sicilians turned to the Spanish who then ruled them for five centuries. I slithered along unable to find shelter until a young man grabbed my arm and escorted me to Monte San Guiliano, a nearby restaurant. I was welcomed, despite my dripping clothes. The smoked sword fish and tuna with orange was so delicious that I was nearly tempted with Sicilian cassata, a delicious cake made of sweetened ricotta, icing and fruit. I resisted despite my increasing enthusiasm for Sicilian food. 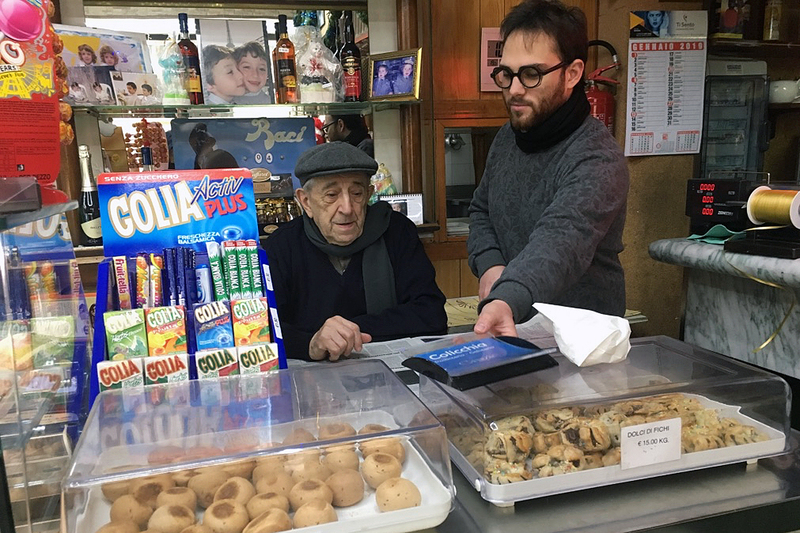 I was anxious not to miss the bus back to Trapani from where I was exploring the west coast: “The bus won’t be coming back up the mountain in this weather”, said the waiter as I paid the bill. 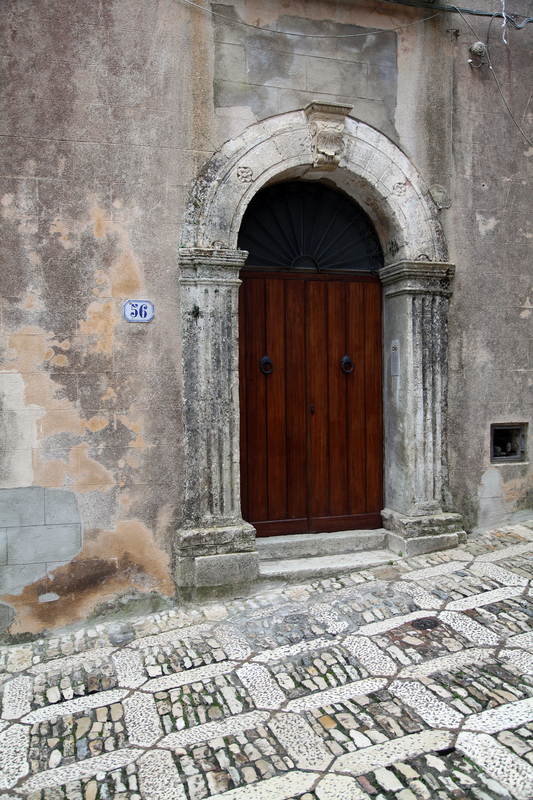 I had no real wish to stay the night – Erice was 5 degrees colder than Trapani where I was already booked into Ai Lumi, a hotel in a Renaissance palazzo. I set off for the bus stop in the hope that the waiter was wrong but the cobbled stones had become even more treacherous. Another young man took pity on me as I gripped an iron railing to stop myself sliding down the mountain – one way to resolve my predicament perhaps. Blinded by the snow we inched our way down the main street. The manager of the Hotel Elimo, who had given me a free cup of coffee before the snow storm, leant out of his window: “I have a spare room,” he cried. I was tempted. If the weather cleared overnight I would be able to visit the site of the temple to Aphrodite, goddess of fertility, the remains of which have been incorporated into the Norman castle at the other end of town. I would be able to climb the campanile of the Chiesa Madre from where Frederick 111 kept watch. 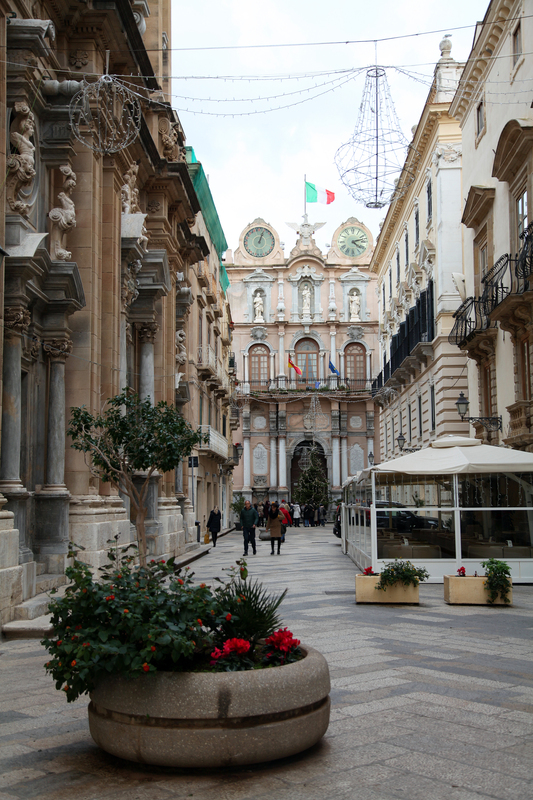 I could visit the museum and see the Annunciation by Antonello Gagini, a famous sculptor of the Renaissance period born in Palermo; and I would be able to taste the almond pastries that adorned the shop windows of the local pasticcerie. Instead, with great stoicism, I stood at the bus stop as dusk descended – there was not a bus nor person in sight and I was frozen. Then I heard a grinding, crunching sound. It was the Funierice cable car nearby. 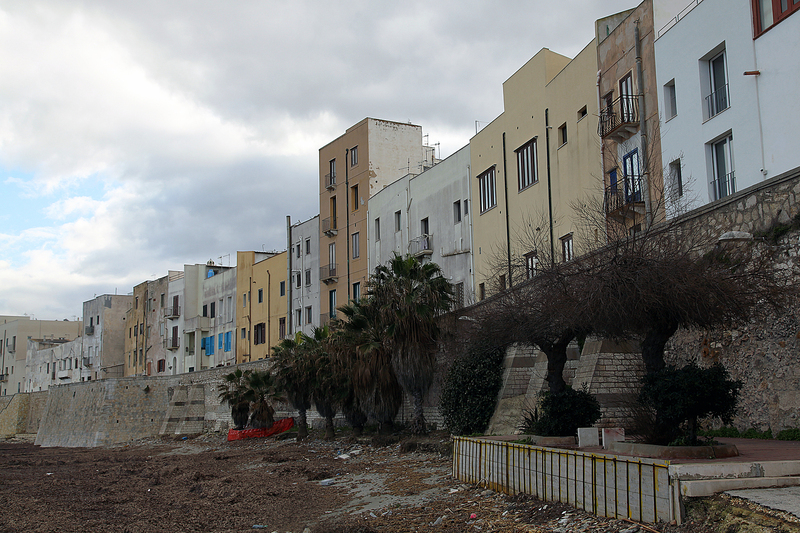 For days it had been out of operation because of the high winds that had prevented me from walking along the coast in Trapani – a city surrounded by sea on three sides. 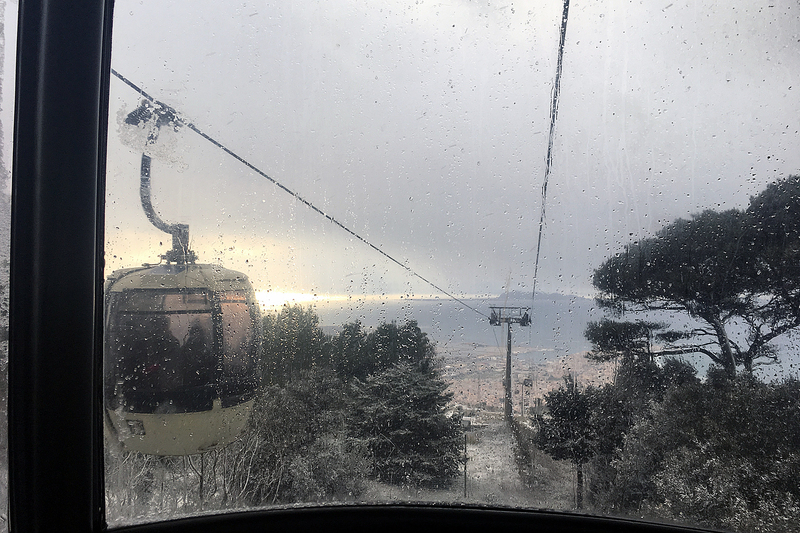 It might be snowing but at least the wind had subsided enough for the funicular to start up again. My regret at not taking up the offer of a room at Hotel Elimo was soon replaced by the spectacular view. 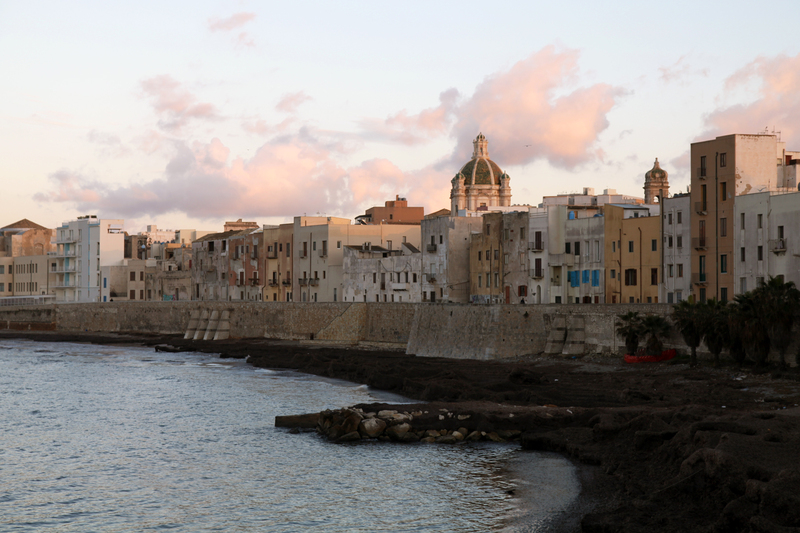 As I descended I saw, through the mist, the entire coast line fanning out from Trapani – down to the flat salt pans and Marsala to the south and up to the rugged mountainous coast to the north. Ahead I could just make out the famous sickle – the thin curved shape of the historic city of Trapani. Legend has it that the sickle fell from the hands of the goddess, Demeter, while she was searching for her daughter, Persephone, who had been kidnapped by Hades. Beyond the sickle I could see the Egadi islands – great humpback whales squatting in the Tyrrhenian sea. But for the swirling clouds, known as the kisses of Venus, I might have seen the distant Cap Bob in Tunisia. I felt cosy in the funicular – far safer than on the bus going up the mountain. But as I stepped out of the cable car the heavens opened – not hail nor snow but sheets of rain engulfing me. I stood on the outskirts of town at a forlorn bus stop providing little shelter and no information. I should have stayed the night in Erice after all. After a downpour or two the funicular operator called me over as a car deposited a passenger going up the mountain. “A taxi” he asserted. Without hesitation I jumped into the front seat of a clapped-out Fiat. The only compensation for being ripped off to the tune of 20 Euros was the gift of a bag of oranges. No doubt from the driver’s garden. 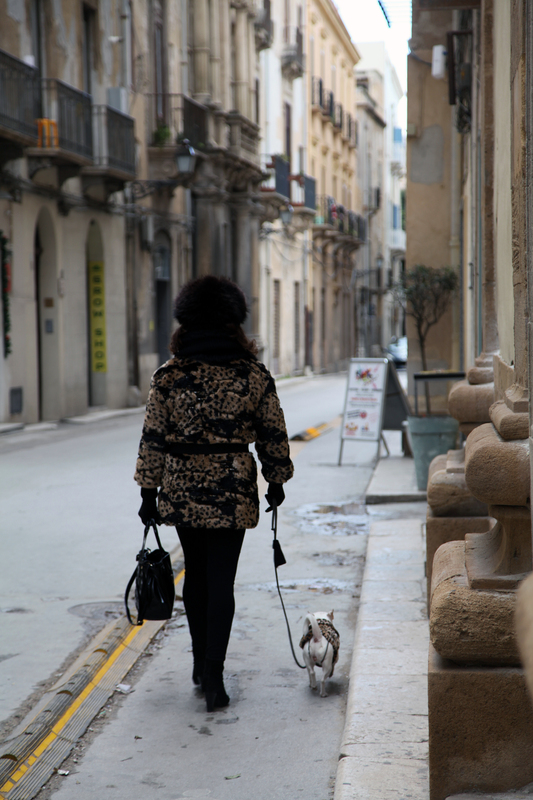 When it is warmer I will return to this part of western Sicily. 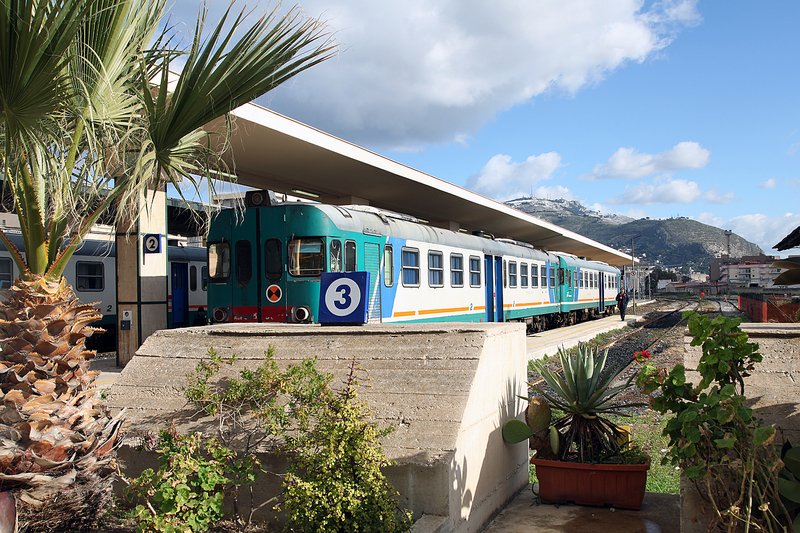 I will stay a night at Hotel Elimo in Erice, perhaps at Easter when the wooden Miseri sculptures representing the stations of the cross are paraded through the narrow streets and when I can see across to Tunisia. Or I will return in late September, early October when the crowds of tourists have subsided. 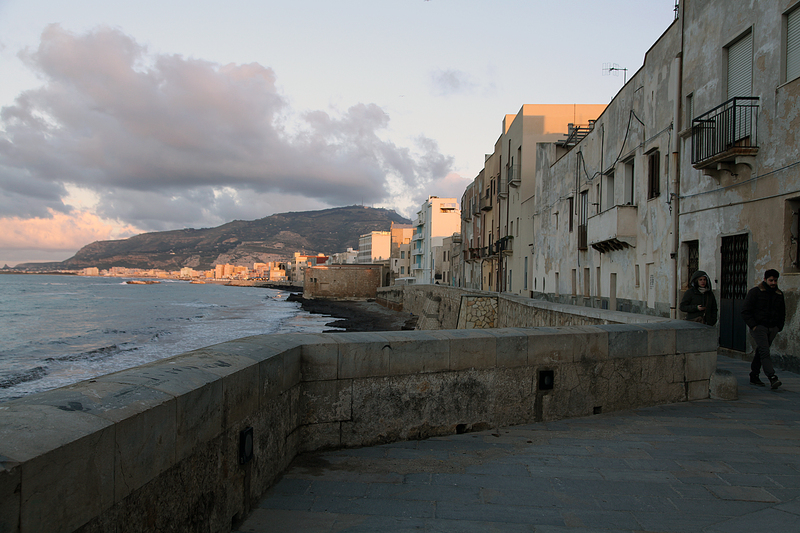 I will travel further to Mazara del Vallo, the first city to be taken by the Arabs and the last to be surrendered. 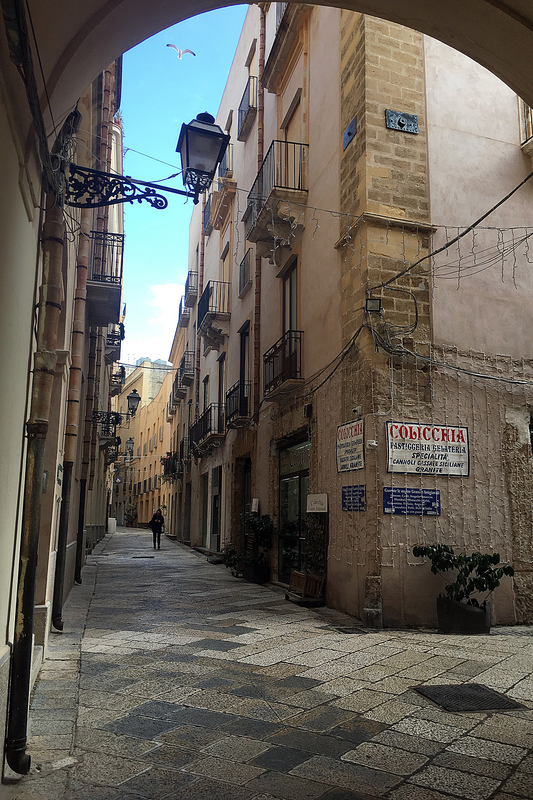 Wandering the casbah-like back streets of the old harbour will remind me that Sicily is not just south of Italy but north of Africa. 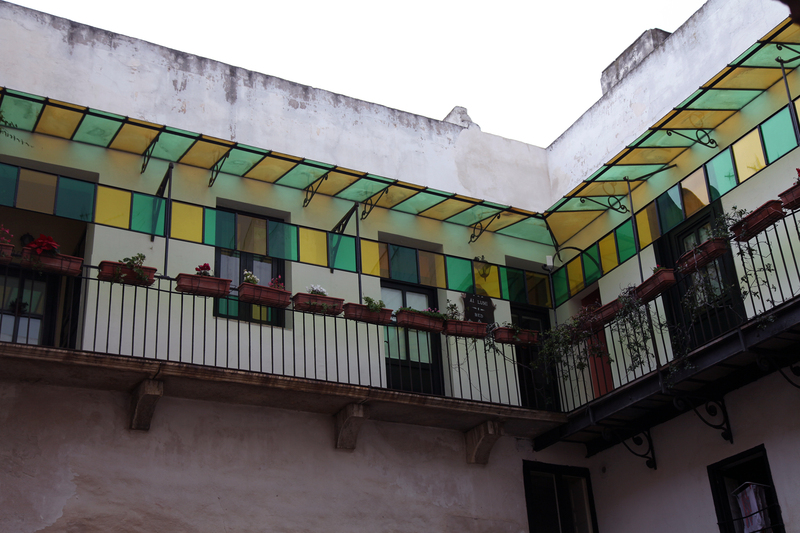 It is this Arab influence that makes this part of Sicily so special, so different. 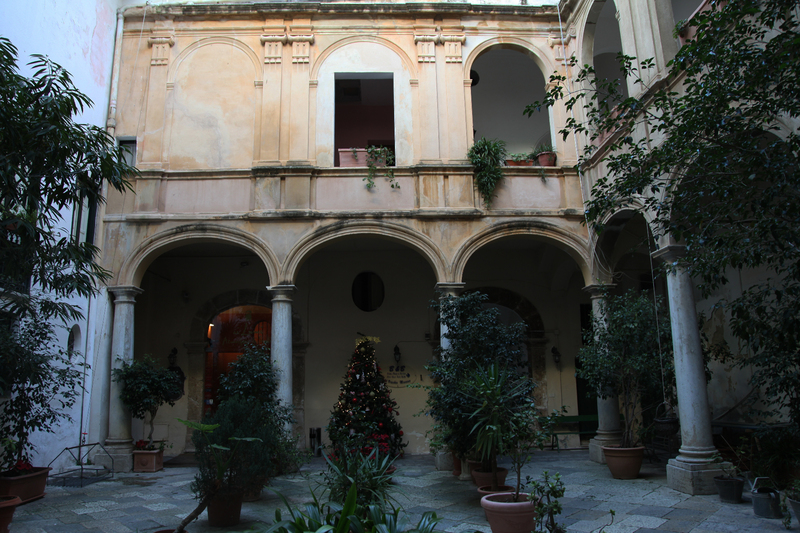 I will stay at Ai Lumi hotel in Trapani with its renaissance façade and excellent restaurant. When the wind does not blow me off course I will walk to the tip of the scythe where the Mediterranean meets the Tyrrhenian sea. 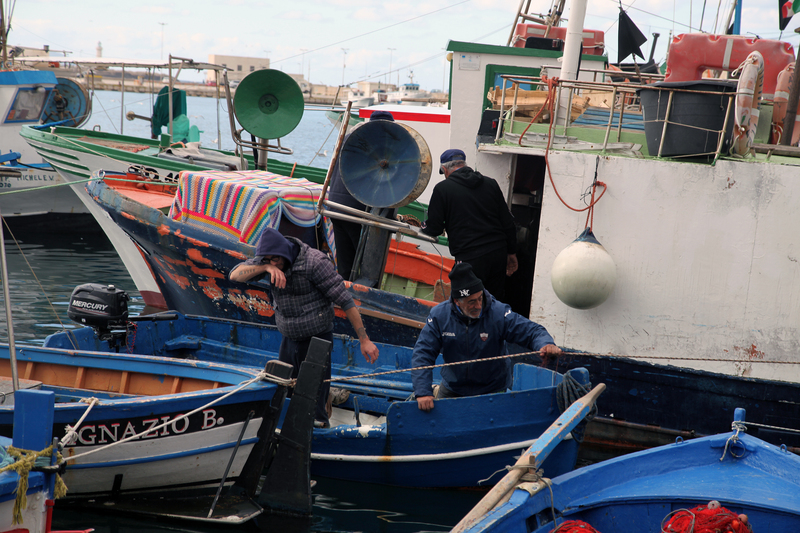 I will eat fish couscous watching fishing boats returning with their catch and liners heading for Genoa, Siracusa and beyond. 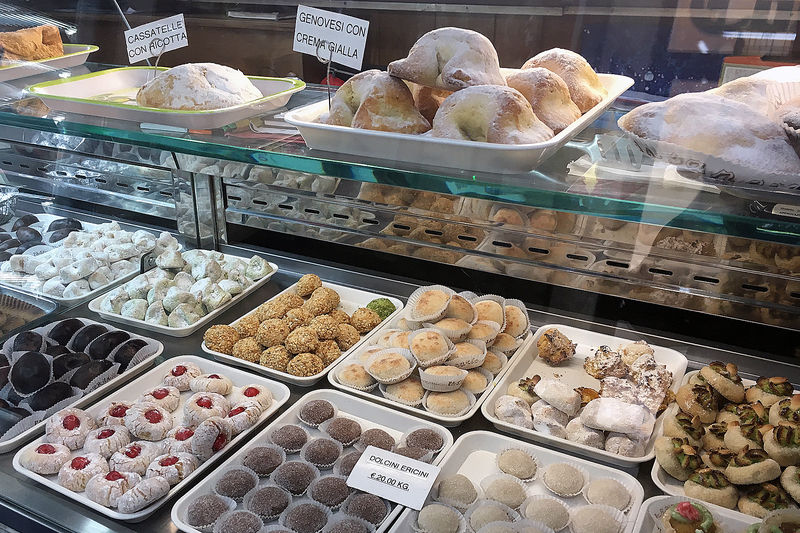 And I will gorge myself on Sicilian sweets at Colicchia pasticceria. 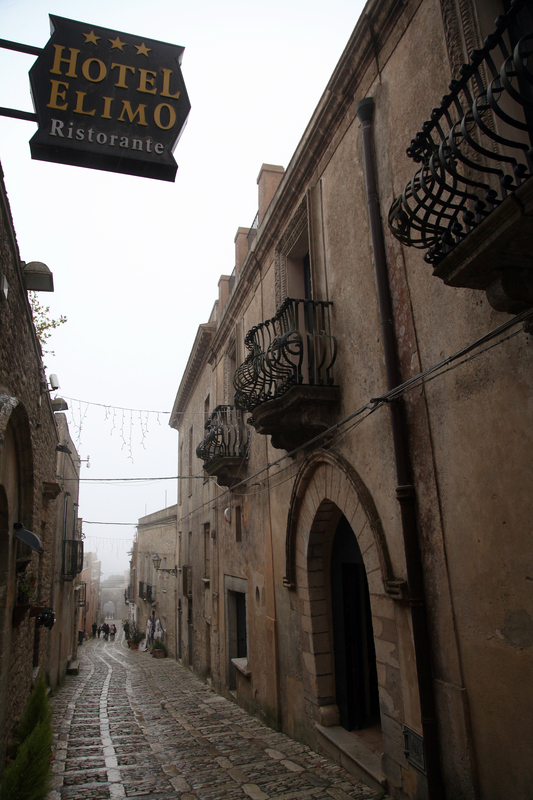 Just read the article about Erice: makes me want to go!